This event is temporarily off sale. Please check back soon for ticket availability. - Seats in the 200 level are in the risers and will include steps. Seats in the 100 level are on the floor. - Child ticket is for the ages of 6-16 years. - Children 5 and under are free if they sit on a lap of a paying adult (they will NOT receive a separate seat or ticket). - Artist subject to change without notice. For reservations, please contact the hotel property individually and mention their unique code to receive the special Great Western Fan Fest rate just for you. 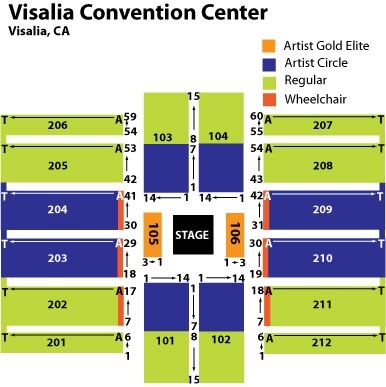 RV Parking in lots within blocks of the Convention Center in Downtown Visalia! To make reservations, call 559.334.0141 or email rvs@visitvisalia.org. - $75 includes 4 nights starting Wednesday - May 2, 2018 through Sunday - May 6, 2018. - Fully paved lots just a short distance from the Convention Center, downtown restaurants, and shops with free trolley service to Convention Center - Spots available on a first-come, first-served basis. - RVs can check in starting on Wednesday - May 2, 2018 and check-out no later than Sunday - May 6, 2018. Quantity discounts are available when you purchase 10 or more qualifying registrations. Offer valid via phone only, call 800-965-9324 to order the discounted rates. Offer is not available the day of the event, you must purchase all qualifying registrations on one order and at one time. Offer cannot be combined with orders already processed or be split under different names. - Purchase 10 or more qualifying registrations and get 10% off per qualifying registration ticket cost. - Purchase 20 or more qualifying registrations and get 15% off per qualifying registration ticket cost. - Purchase 40 or more qualifying registrations and get 20% off per qualifying registration ticket cost. - All Child Registrations (Three Day & Single Day) *Child rates do NOT apply for an additional discount when purchased with a quantity discount order. However, child tickets are a qualifying ticket towards reaching the quantity discount. SINGLE DAY ARTIST CIRCLE Child tickets ages 6-16 years. Children 5 and under are free if they sit on a lap of a paying adult (they will not receive a separate seat or ticket). SINGLE DAY REGULAR RESERVED Child tickets ages 6-16 years. Children 5 and under are free if they sit on a lap of a paying adult (they will not receive a separate seat or ticket).